I was looking for a different picture this morning when I ran across this picture. It is a slightly modified version of the flying Ford Anglia from the 4728 Escape from Privet Drive set. 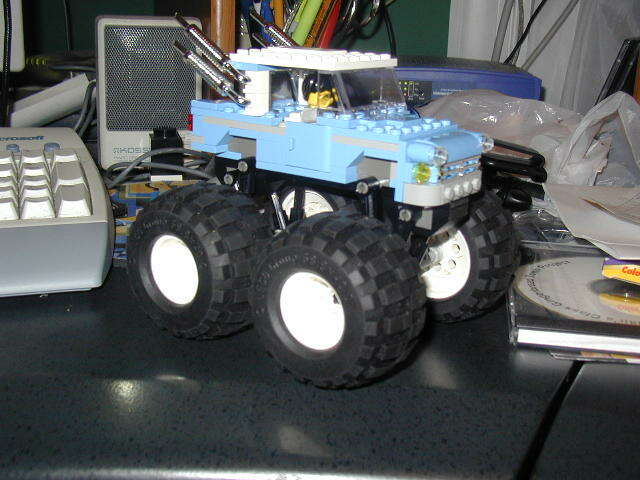 I adapted this from the basic model, adding a monster truck undercarriage I had developed for another truck and some heavy duty chrome exhaust pipes. I built it as a joke, my son and I thought it would be pretty funny but it turned out to be pretty popular on the NCLTC layouts. At the time, the Harry Potter sets were popular and readily available. I also have a monster truck version of the 4755 Knight Bus. It is pretty funny looking mostly because the Knight Bus is so tall. People often ask where the wheels came from. I was fortunate enough to pick up quite a few copies of 5561 Big Foot 4×4 Model Team set. This set was really in demand from train builders as at the time, it was one of the very few sources of train doors and windows. I was on a mission to built a white and black version of the Metroliner and as a result, ended up with quite a few of these big wheels. They are ideal for MiniFig scale monster trucks. This entry was posted in Events, MOC, NCLTC. Bookmark the permalink.